On April 10, 2016 a celebration for Russell Hartenberger was held in Walter Hall at the Faculty of Music of the University of Toronto for Russell’s retirement. In attendance were many of Russell’s colleagues, former students and friends, including special guests, Janet and Alan Abel. Mr. Abel, even before joining the percussion section of the Philadelphia Orchestra, was Russell’s teacher in Oklahoma in the late 1950s. I first met Russell Hartenberger in 1963, when I was a 15-year-old high school student. 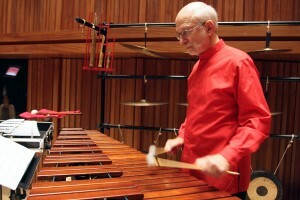 It was at a rehearsal of Alan Abel’s Settlement Music School Percussion Ensemble in Philadelphia, where “Three Brothers” by Michael Colgrass was being rehearsed. One of the three players in this piece was a student from the Curtis Institute who was filling in on the timpani part for one of the absent high-school percussionists. In those days “Three Brothers” was a tour-de-force for percusionists – a technical showpiece with many tricky passages. We budding high school musicians were eager to see what this timpanist from the prestigious Curtis Institute could do, and we were not disppointed, because the timpani part was played faster and more rhythmically accurate than we had ever heard before. The timpanist of course, was Russell, and little did I know that not only would I be amazied by this level of performance again, but I would have the an entire lifetime in NEXUS filled with these moments. – The orchestras of Akron, Anchorage, Atlanta, Buffalo, Columbus, Dallas, Dayton, Des Moines, Detroit, Flagstaff, Indianapolis, Kansas City, La Jolla, Louisville, Memphis, Milwaukee, Minneapolis, Nashville, Omaha, Phoenix, Richmond, Sacramento, St.Paul, Syracuse, Toledo, and Utah, just to list a few. – Victoria, Prince George, Vancouver, Nelson, Edmonton, Calgary, Saskatoon, Winnipeg, Sioux Lookout, Oshawa, Kingston, Ottawa, Trois Rivieres, Quebec, Riviere-du-loup, Moncton, Dalhousie, Halifax, and much, much more. And all of this was only with NEXUS, not including Russell’s performances with Steve Reich, Paul Winter, and many others. And Russell has had an enormous influence on percussion performance in Canada through his studio at the University of Toronto and through the worldwide interest in his compositions for percussion, especially in recent years. Russell’s administrative and inter-personal skills in working with others were always devoted to the pusuit of the best possible musical environment for his students and colleagues. As Russell makes the transition into the next movement of his life-symphony – surely a scherzo – he can rest assured that his work has enriched the lives of everyone who knows him.